Studying the Word deepens our relationship with God more than anything, in my opinion. I work intentionally each day to develop and grow my relationship with Christ. That’s important, no doubt. But there’s more available to help us connect with Him through weekly group bible study. Being able to join together with a group of like-minded women who desire a closer relationship with Jesus Christ blesses me beyond belief. That’s ONE of the reasons I sign up for ladies’ bible study at my church almost every single fall and spring it’s offered. I have taken a semester off because I thought I was too busy. It only took a couple weeks before I realized how much I missed my ladies. Busy or not, I need my ladies’ bible study time. Throughout the years, this group of ladies and I have come together on Tuesday nights to study God’s Word. It’s fascinating to me to listen to everyone and recognize that we all come from different places with different struggles but yet we’re all the same. We all search for Him to guide us and lead the way. Sometimes, we have homework. It doesn’t always get done; I’ll admit that. In early days, I considered skipping if I didn’t have all my lessons finished. Then, I came to learn my group accepted me anyway. (Note: I get more out of it when I do my lessons, though! Eek!) And, some of them hadn’t always done all their homework either! Other times, I’m not sure I understand completely the lessons. Inevitably, I or someone else speaks up and admits their confusion. Again, there’s no judgement. Just good conversation about what God is calling us to do. New ladies join, and most often after a few weeks they begin to open up and share and grow with us. Sometimes, someone will drop out. Maybe we’re not what they need at that particular time in their lives. We check on them and ensure they know they’re always welcome back. As our relationships and connections grow, I’ve come to realize that I depend on my weekly bible study for way more than learning about the bible. If you’ve been active in bible study, I’m sure you have felt the same. 1. Sacred time just for me to spend time with God, for God, for me. On Tuesday nights, my family knows they’re on their own. In early days my kids would ask me, “What’s for dinner?” Soon, I began to see them start to ask, stop, and then say, “Oh yeah, it’s your bible study night. I’ll ask Dad.” Rather than feel guilt that I missed this one evening a week with them, I feel grateful I can model to them the importance of taking time for God and the confidence that they can come together and care for themselves a few hours a week. Plus, I get a chance to refresh and renew in Him. 2. A time for much needed laughter and stress relief. Having a chance to discuss the daily joys in our lives helps us to re-live them. Inevitably, we giggle and then guffaw over various experiences throughout our week. Having a time to laugh together helps relieve the weight of stress and struggle. I can feel it drop from my shoulders. 3. 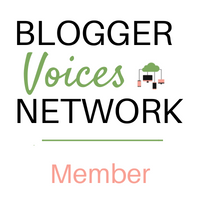 A safe place to share hopes and dreams, fears and failures. Growing up, I never had a large group of girlfriends. I was always the type to have a few close friends to hang out with. In my ladies’ bible study, it’s different. We have a group that can range between 6 and 20 on any given night, but because of our consistency in meeting and sharing, we’ve developed bonds that will never break. I’m positive I can share anything with my ladies and while they may not always understand, they’ll open their arms and hug me close. It’s really the most amazing thing I’ve ever witnessed. The benefits of bible study go way beyond even these three things. I know many others have been blessed by their studies, too, such as in this post, 5 Unexpected Benefits of Group Bible Study, from Crosswalk.com. 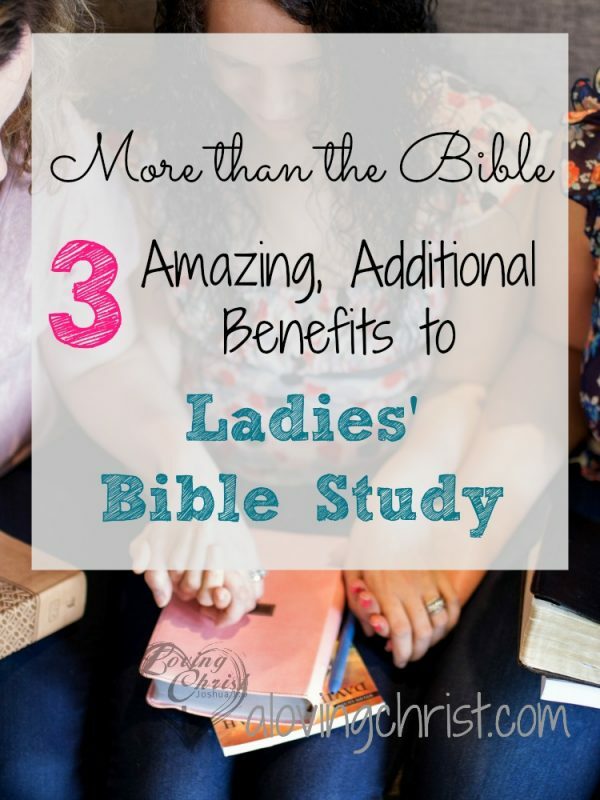 Have you been a part of a ladies’ bible study? What have you found to be your most favorite thing beyond the lessons themselves? Related Post: Are You Tired of Feeling Guilty, Too? Not part of an in-person study group? I encourage you to find one close to you and soon! 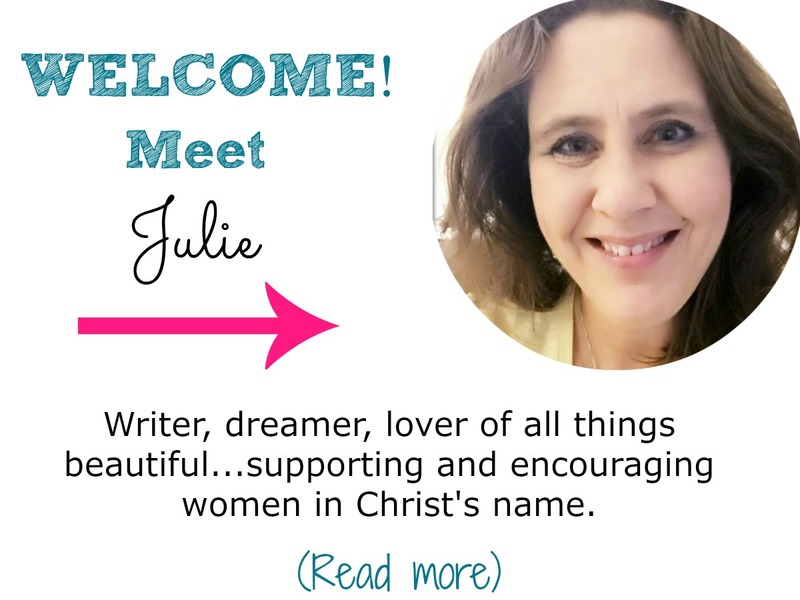 The trepidation you might feel over joining a group of women you don’t know will quickly be overcome by the blessings you’ll receive. If you have questions or are unsure, please email me and talk them through with me!